"The discovery of coal within the banks of Coal Grove, part of Mineral Township, by John Green Reed in the fall of 1834, earmarked the first coal found in the county and, probably, in all of northern Illinois. This discovery is also the reason the new populated village of 300 was named Mineral. The first mines were operated by John VanVilzer, James Sprague, W.H. Forrest, Peter Duncan, and the Sheffield Mining Company. The mines were scattered throughout Barren Grove and through the years were a great source of employment for about 50 to 75 men. Much coal was hauled by large trucks as far as Sterling, Il., besides supplying local needs. Strip mining forced the closure of these local mines. Louis Brandt, Sr. was the last to operate a mine south of Mineral. Gold Township, Mineral's neighbor to the north, took its name due to its great abundance of game and wildlife in the fomerly marshy lands; an attribute its earliest settlers felt was as "good as gold!". The remainder of Mineral Township included Barren Grove to the south, which contained a good supply of timber, and Hickory and Coal Creeks which ran parallel though the township from east to west. 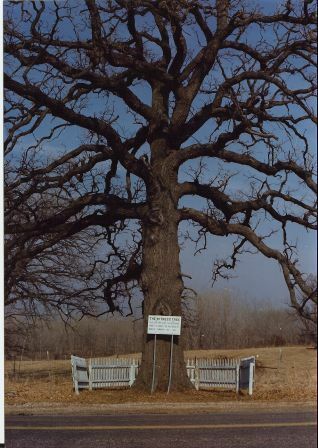 Photo Taken by Roger Moore - "This oak tree served as a surveying point for the railroad 1851-53"
WIth the influx of settlers, the township was organized in 1850. At about 1853, William and Evelyn Riley, the first settlers of Mineral, obtained from Mr. Phillips, a large portion of land in a trade for three yoke of oxen and a new wagon. The land north of the railroad is known as Riley's addition to Mineral and was the first section of the village built up. The building first used as a school (assuming that was the home that William Riley donated to be used as a school), was later moved a block west and became the Baptist Church. It was later moved again to the east end of Main Street where it was purchased by the American Legion Clark-Carrington Post. The legion used that as its home until it was demolished to make way for the Mineral Post Office. William Riley was the first postmaster of the village and the first agent for the railroad. Some early records show Riley Squires as the first child born in Mineral Township and G.T.A. Squires as the second. W.S. Reed was another of the first born in the new township. Another pioneer of the early times was Dr. George Stone, who located on a farm owned by the Lyon family and the Kenneth Bennett family. Dr. Stone was the father of H.A. Stone and was a renowned specialist in the cure of cholera. He purchased "one-eighty" of his farm through the sale of a horse for $75. In 1868, the first elevator was built, with managers Hiram Stone and a Mr. Whitmore. As Mineral proved to be a great grain shipping point, in regards to the railroad, another elevator was built and operated by the Farmer's Company. Mineral is also said to have been the best shipping point for grain around from Rock Island to Chicago. In 1883, an Educational Association, which was connected with the County Association, was organized. 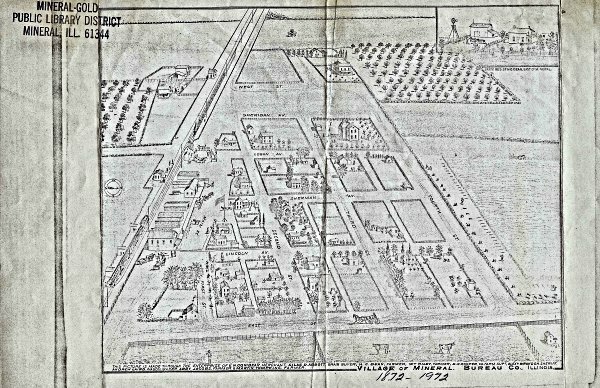 In 1894, two new 10-acre sections were added to the village, purchased from Charles Tomlinson and Thomas Durack. In the early 1890's, a blacksmith and wagon shop was run by A.M. Laird for many years. It was purchased by John Christian. In 1889, Pollard and Goff of Mason County, Il. secured the contract to dredge the large wet tract north of Mineral (Gold Township). This section of land is known as Goose Pond. Dredging helped to drain the land and furnished outlets for the tile which had been laid. The process reclaimed 10,000 or more acres of rich farming lands and was finished in 1902." The early 1900s saw the completion of the Hennepin Canal just north of Mineral. By the time it was officially completed (1907) however, the use of the train had made it fairly obsolete. Between World War I and World War II Mineral hit a population peak of about 350 residents. After World War II the country saw its industrial serge. The farm implement industry in the "Quad Cities" brought many jobs for people in the area, this included several men from Mineral. It is said in the article, that at Mineral's peak, there were two restarurants, three bars, a grocery store, a barber shop, an upholstery shop, a heating and plumping store, a lumber yard, two grain elevators, three gas stations, a welding shop, and a motel. The Grand Army Highway known as U.S. Route 6 was given a great deal of credit for this activity being brought into town. The 1960s brought even more progress, this time in a bad way for Mineral. Interstate Highway 80 was created just north of town. This new route took virtually all foreign traffic away from Mineral's business district. The state of Illinois decided to have I-80 bypass Mineral, not allowing for an exit ramp to the village. The village board requested consideration for an exit ramp however their request was denied. . There is much more information we would like to share regarding Mineral's wonderful past. This page will include a "memories" section for those of us who remember more details of Mineral's history that we learned or experienced while growing up. If you have memories or knowledge you wish to share on this page, please write to us at dpnanninga@comcast.net.